While hundreds of thousands of businesses use professional employer organizations (PEOs), many questions remain about who they are, what they do, and what the business relationship looks like with clients. These FAQs help answer many of these common questions. A professional employer organization (PEO), often called an Employer of Record (EOR) in Canada, is an employment solutions provider that partners with clients and acts as the legal employer for some or all of a company’s workforce. As the legal employer on record, the PEO employs talent, pays workers, ensures employment compliance, and meets all regulatory and employment requirements. What Can I Expect from a PEO? When you partner with a PEO, you will be unburdened of the administrative HR, payroll, and compliance responsibilities that come with employing workers in Canada or the US. You’ll be able to focus on your core business while the PEO focuses on the day-to-day management of employees. Many small, mid-sized, and large businesses expanding into the US or Canada or seeking to employ talent in these countries use the services of a PEO to streamline expansion efforts, reduce costs, mitigate risks, and speed up market entry. A PEO has the resources, local knowledge, and regulatory expertise required to manage employees compliantly in a foreign country. Absolutely not. While you retain ownership of your business and control of its operations and workforce, the PEO assumes the responsibility and liability associated with employing a workforce, including payroll, health and safety, and HR support. A PEO does not supply labour to worksites. Rather, the provider manages the employment-related responsibilities of a company’s permanent workforce, including payroll, benefits administration, compliance, and health and safety. By comparison, a leasing company supplies the workers on a project-based or temporary basis, and these employees are returned to the leasing company after completion of the work. What Is the Difference between a PEO and a Staffing Agency? PEOs do not supply labour. Similar to a leasing company, a staffing agency will recruit and hire employees for a client, and these workers are traditionally a small percentage of the client’s entire workforce. A PEO, on the other hand, handles the day-to-day responsibilities of managing a client’s permanent workforce. Employees are seeking financial security, quality benefits, and a safe work environment. A PEO will ensure your US and Canadian workers are paid on time and accurately, are offered high-quality health insurance, and have the health and safety training required to work safely. Employee productivity and job satisfaction increase when clients engage a PEO. Who Is Responsible for Employees’ Wages, Taxes, and Employment Compliance? Your PEO will assume the responsibility and liability of employee wages, compliance regulations governing payments of taxes, and reporting. The cost of hiring a payroll provider, a human resources specialist, and legal counsel is far higher than employing the services of a PEO. With a PEO, you will only pay one price, with no hidden fees. Can’t I Handle These Responsibilities on My Own? 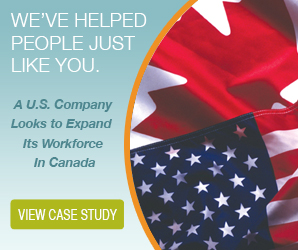 While you can manage remote employees in Canada and the US on your own, it is a complex task. The rules and regulations for payroll, HR, and employment standards will vary from your home country and from province to province or state to state. Managing payroll and related employment issues is also resource-intensive and time-consuming. Most business owners who are expanding their workforces simply do not have the expertise, time, and resources to do so on their own. Partnering with a PEO provides many benefits that enable you to focus on your business rather than the intricacies of HR and payroll in a foreign country. If I Want to Hire a Canadian Employee, Does My Company Need to Register a Business Presence in Canada? You need to ask yourself these two questions; Are you invoicing a Canadian company for your goods or service? Is this Canadian employee working for the benefit of a Canadian company (regardless of whether their head office is in your country of origin)? If you answered yes to either one of these questions then yes, your company will need to register a Canadian business in order to comply with Canadian rules and regulations. If you answered no, then you may be able to just engage in the services of an employer of record like The Payroll Edge. Call us and we can help clarify. As a Foreign Company, Can’t I Just Pay a Canadian or US worker as an Independent Contractor? Maybe. Like many other countries, Canada and the US have very strict rules when it comes to paying independent contractors. Is the contractor only working for you and do you dictate their hours and expectations? Are they working for you for an extended length of time and do you have workers in your country of origin that do the same job but are considered employees? The fines and penalties of paying someone in the wrong classification can be steep especially for a foreign company trying to evade the complications of another country’s regulations. The Payroll Edge has an approved process for qualifying independent contractors that guarantee’s compliance. For more information, please contact The Payroll Edge. Have more questions? Contact us today to discuss your needs and challenges.